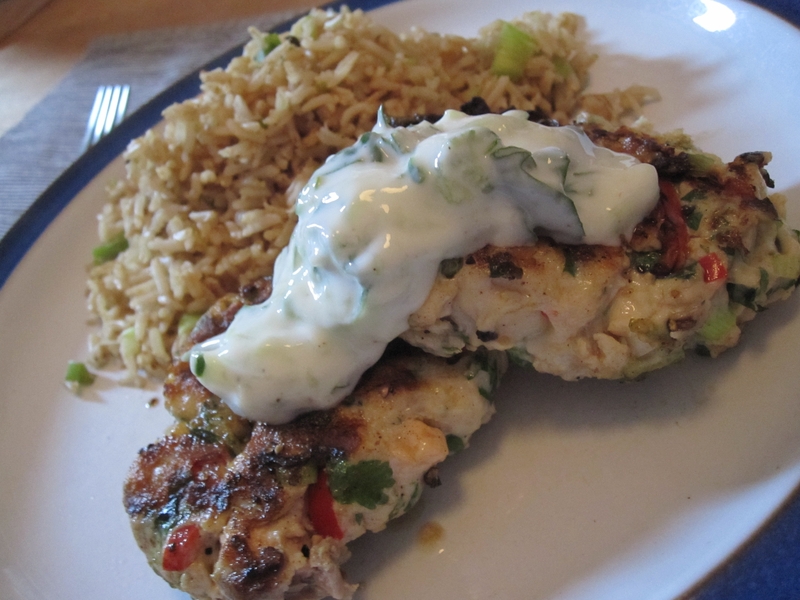 I have wanted to use a recipe I had for fish kebabs for ages, and decided that one night after a big workout would be the night, however I had not read the whole recipe through, only the fact that it took 25 minutes in total which wasn’t true! 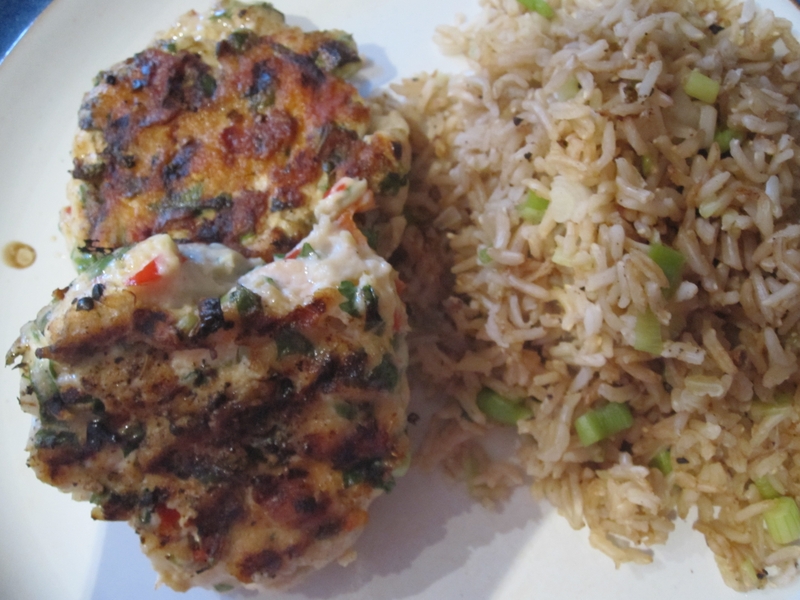 So I had to improvise a little and change them to patties as they might not have held on a kebab… this meant they worked out a little expensive as instead of two dinners and one lunch it only made two dinner but you could easily add some potato or make them smaller to make them last longer or just reduce your quantities of fish and make enough for one dinner. If you are going to do large ones like this, I recommend halving the recipe and only buying as much fish as you would eat normally, i.e. 1 fillet per person, you could bulk it out with mashed potato if needed. 1. Remove any bones left in the fish and roughly chop, mash the fish with the egg white together, use a food processor if you need to, then add the chillies, spring onions, coriander leaves, mint, ginger, garlic, lime juice and zest and mix well. 4. 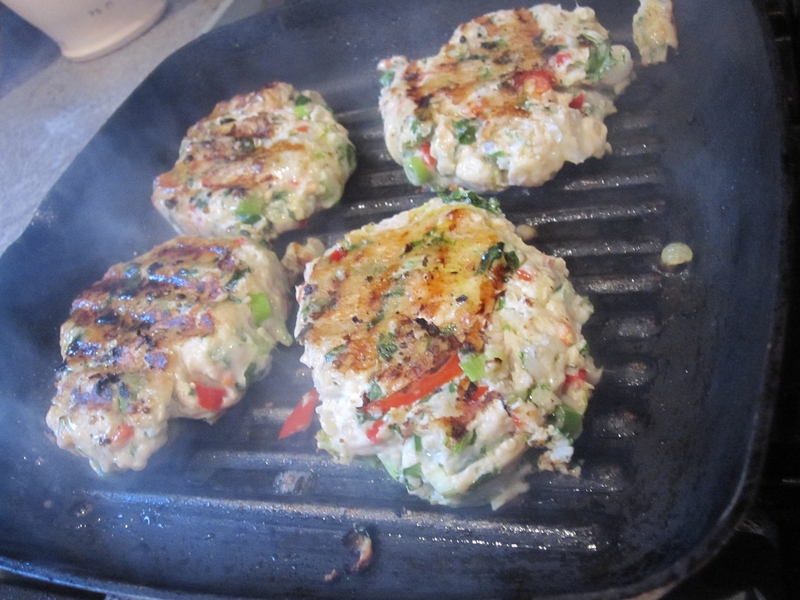 My patties were quite large and I then griddled them for 10-15 minutes, turning frequently. So good, and very healthy if a little expensive! First boil some water and cook your pasta, I like my al dente so only cooked for about 7 minutes but this can take up to 10 as well, at the same time pop the salmon in the oven at 180C for about 10 minutes (this will vary depending on your oven), you could also poach or grill the salmon. I sprayed it with a little olive oil and cracked some seat salt and black pepper over the top. Then zest your lemon and add to about half a small pot of crème fraiche depending on your taste (whether you want a thin coating or lots of sauce), juice half of the lemon and add this as well, then crack some seat salt and black pepper into it to taste. Steam your asparagus for 3 minutes to keep it nice and crunchy then cut into 1 inch piece, then half your cherry tomatoes and mix it all together, maybe heat for 2 minutes and serve! So last weekend I decided I wanted to spoil the Boy, by cooking him a 3 course meal and that I would make a real effort on presentation, which is not my forte! 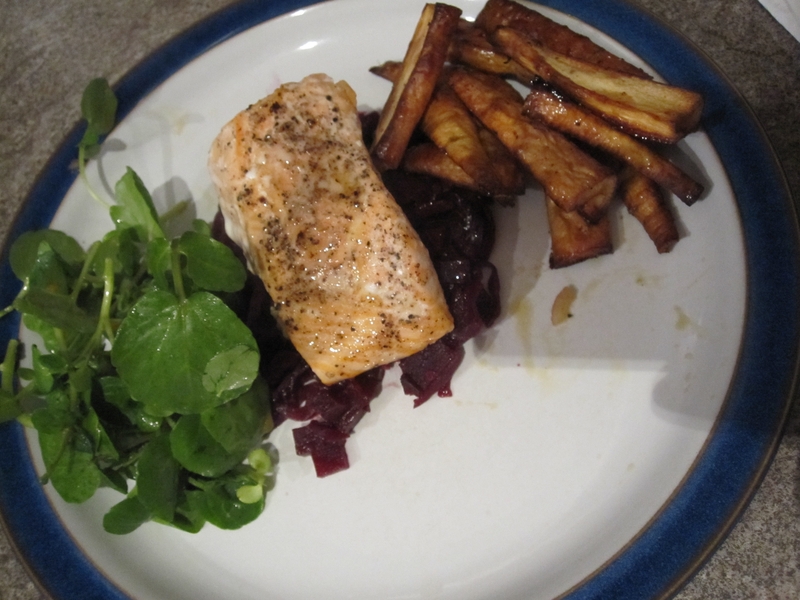 I cannot remember where I got the starter idea from I just love goat’s cheese and I have wanted to roast some beetroot at home for ages and thought the purple of the beetroot would be impressive. 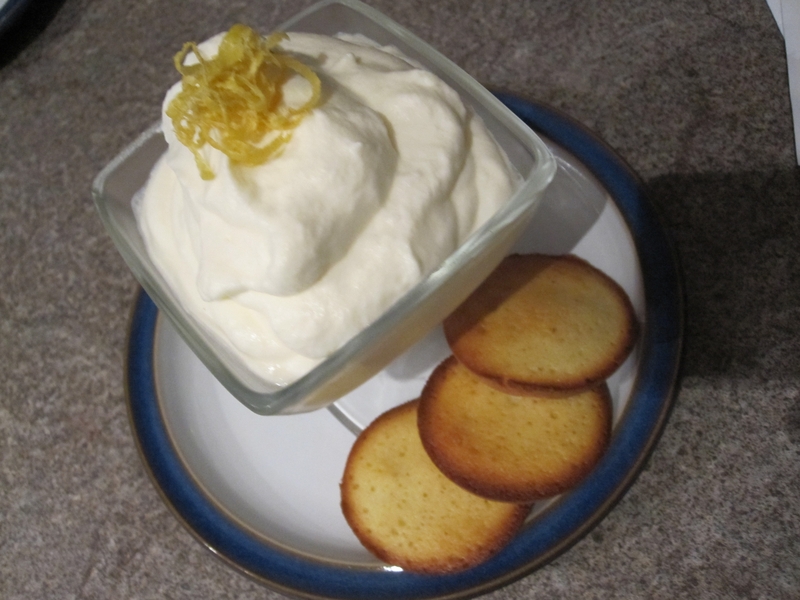 The lemon posset recipe from a National Trust Summer Pudding book my Mum brought me, you can buy it here. 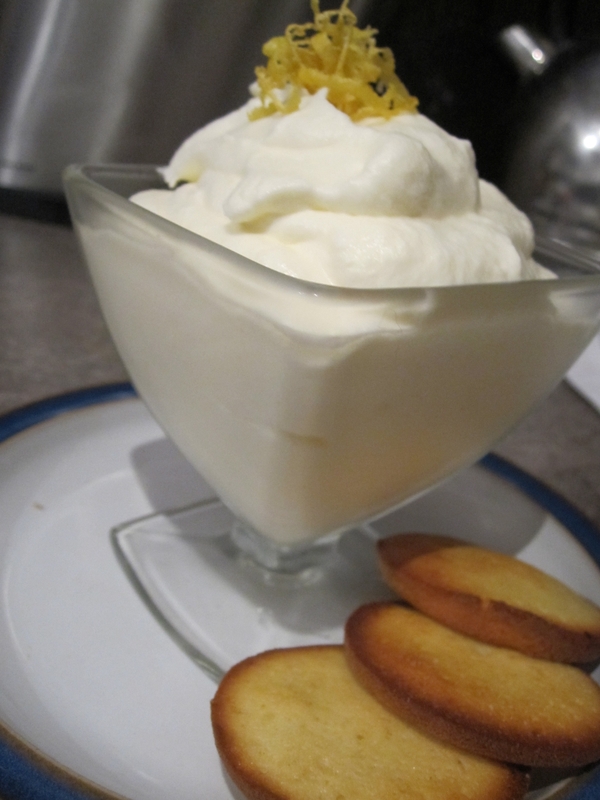 Lemon posset is one of my favourite puddings and I have always wanted to make it. The result was very different from those I have had in restaurants which have always been pudding like, but mine was more of a mousse, probably because of the added egg whites and so was very light, it was very good! Firstly you need to roast the beetroot, I cut off the top and bottom but left the skin on, drizzled in olive oil with black pepper and salt and roasted for about 45 minutes at 180c, but this will vary depending on size, the lower heat and slower you roast them the better. You can do this early on or even the day before if you like, or you could even use ready cooked beetroot, but it much nicer roasted yourself. 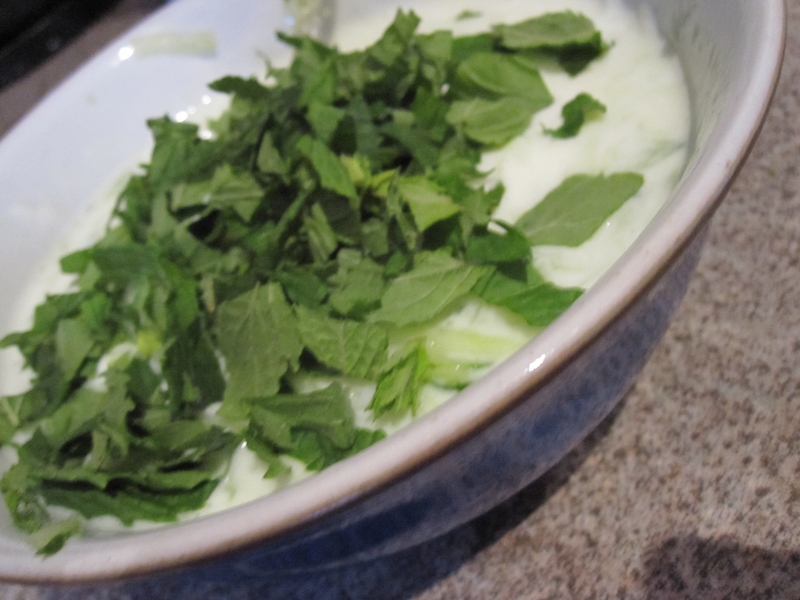 To prepare the goats cheese pop it all in a large mixing bowl, with the milk and whip using an electic mixer then add the herb, salt and pepper and whip until combined well. 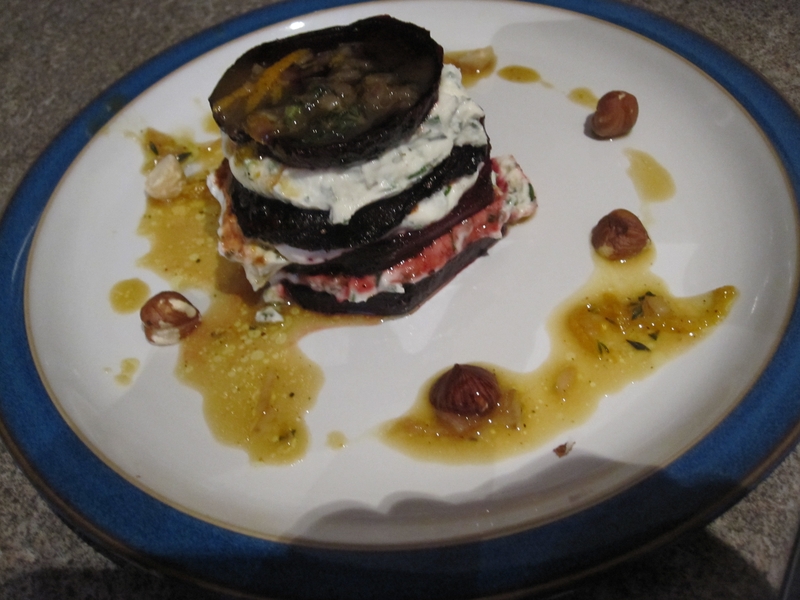 This can be put aside until you’re ready to eat, then just stack it all up, I did four layers of beetroot, three layers of cheese, I suggest you slice your beetroot as thinly as you can and maybe only have three layers as ours was quite a big starter in the end. Add the red wine, bring to the boil and simmer for 5 minutes. Add the orange juice, cranberry jelly, red wine vinegar, sea salt and pepper, tossing well. Bring to the boil and simmer, covered, for 45 minutes, tossing occasionally and adding a little water if necessary. Season the salmon, brush the skin with olive oil and sear, skin-side down, on a flat griddle pan or in a large frying pan until crisped. Place skin-side up in the roasting pan and bake for 15 minutes or to your liking. Beat the cream and the lemon rind in a mixing bowl until thick. Beat in the wine until thick again. Add the lemon juice very gradually, beating all the time. Add sugar to taste and beat until stiff. Whisk the egg whites until stiff and standing in peaks, then whisk in the 2 tablespoons of sugar until smooth and glossy. Melt the butter over a low heat then leave to cool. Then sieve the flour in, fold this in with a wooden spoon and fold in the butter with the orange flower water. 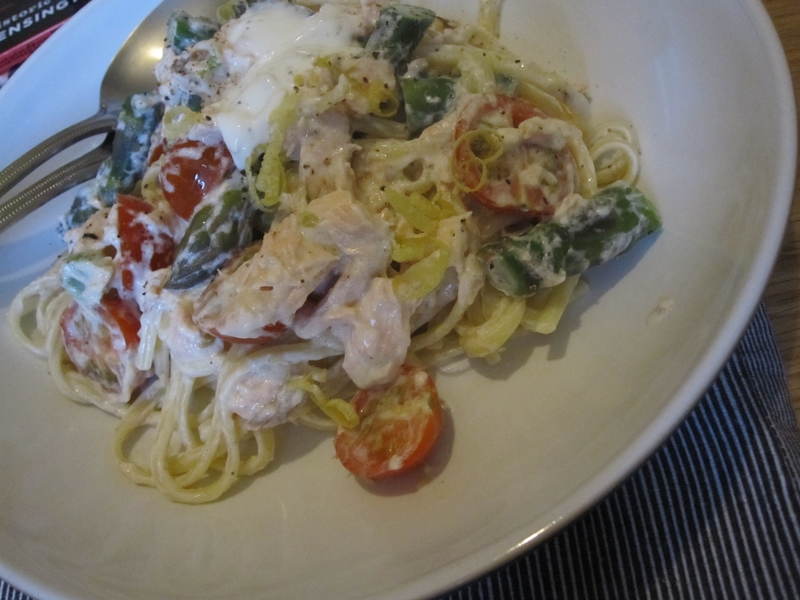 Leave this in the fridge for an hour then take out and leave at room temperature for half an hour.